Containerisation has brought a lot of flexibility for developers in terms of managing the deployment of the applications. However, the more granular the application is, the more components it consists of and hence requires some sort of management for those. One still needs to take care of scheduling the deployment of a certain number of containers to a specific node, managing networking between the containers, following the resource allocation, moving them around as they grow and much more. Google has given a combined solution for that which is Kubernetes, or how it’s shortly called – K8s. In this article, we will look into the moving parts of Kubernetes – what are the key elements, what are they responsible for and what is the typical usage of them. We will then have them all installed using the docker container provided as a playground by K8s team, and review the components deployed. Before we dive into setting up the components, you should get comfortable with some Kubernetes glossary. Kubernetes targets the management of elastic applications that consist of multiple microservices communicating with each other. Often those microservices are tightly coupled forming a group of containers that would typically, in a non-containerized setup run together on one server. This group, the smallest unit that can be scheduled to be deployed through K8s is called a pod. This group of containers would share storage, Linux namespaces, cgroups, IP addresses. These are co-located, hence share resources and are always scheduled together. Pods are not intended to live long. They are created, destroyed and re-created on demand, based on the state of the server and the service itself. As pods have a short lifetime, there is not guarantee about the IP address they are served on. This could make the communication of microservices hard. Imagine a typical Frontend communication with Backend services. Hence K8s has introduced the concept of a service, which is an abstraction on top of a number of pods, typically requiring to run a proxy on top, for other services to communicate with it via a Virtual IP address. This is where you can configure load balancing for your numerous pods and expose them via a service. A K8s setup consists of several parts, some of them optional, some mandatory for the whole system to function. Let’s have a look into each of the component’s responsibilities. The master node is responsible for the management of Kubernetes cluster. This is the entry point of all administrative tasks. The master node is the one taking care of orchestrating the worker nodes, where the actual services are running. Let's dive into each of the components of the master node. The API server is the entry points for all the REST commands used to control the cluster. It processes the REST requests, validates them, and executes the bound business logic. The result state has to be persisted somewhere, and that brings us to the next component of the master node. etcd is a simple, distributed, consistent key-value store. It’s mainly used for shared configuration and service discovery. It provides a REST API for CRUD operations as well as an interface to register watchers on specific nodes, which enables a reliable way to notify the rest of the cluster about configuration changes. An example of data stored by Kubernetes in etcd is jobs being scheduled, created and deployed, pod/service details and state, namespaces and replication information, etc. The deployment of configured pods and services onto the nodes happens thanks to the scheduler component. 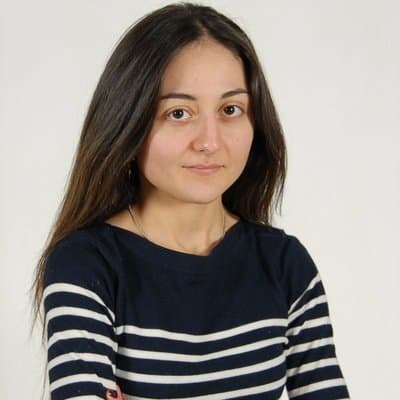 The scheduler has the information regarding resources available on the members of the cluster, as well as the ones required for the configured service to run and hence is able to decide where to deploy a specific service. Optionally you can run different kinds of controllers inside the master node. controller-manager is a daemon embedding those. A controller uses apiserver to watch the shared state of the cluster and makes corrective changes to the current state to change it to the desired one. An example of such a controller is the Replication controller, which takes care of the number of pods in the system. The replication factor is configured by the user, and it's the controller’s responsibility to recreate a failed pod or remove an extra-scheduled one. Other examples of controllers are endpoints controller, namespace controller, and serviceaccounts controller, but we will not dive into details here. The pods are run here, so the worker node contains all the necessary services to manage the networking between the containers, communicate with the master node, and assign resources to the containers scheduled. Docker runs on each of the worker nodes, and runs the configured pods. It takes care of downloading the images and starting the containers. 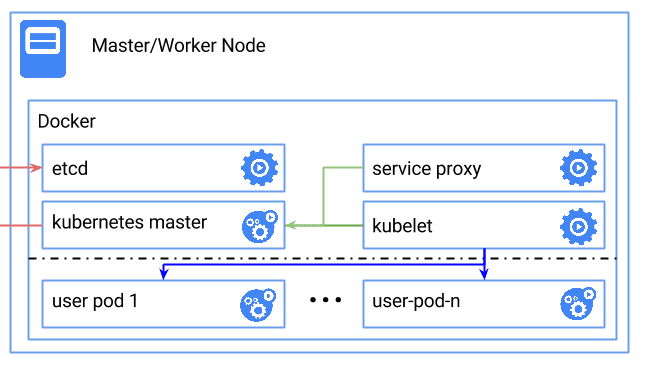 kubelet gets the configuration of a pod from the apiserver and ensures that the described containers are up and running. This is the worker service that’s responsible for communicating with the master node. It also communicates with etcd, to get information about services and write the details about newly created ones. kube-proxy acts as a network proxy and a load balancer for a service on a single worker node. It takes care of the network routing for TCP and UDP packets. And the final bit – a command line tool to communicate with the API service and send commands to the master node. The easiest way to start is to run all the described components inside a docker container. The only thing you need for this setup is a docker daemon. The rest is taken care of the docker image. This example is for educational purposes. In a normal setup, you would have the master and worker(s) separated and possibly running behind a firewall. Let’s start by retrieving and setting the latest version of Kubernetes as an environmental variable, so that we can use it in later calls. Run this command on the host server, where the docker daemon is running. We also assume that the host you are running on has the amd64 architecture(you can refer to other architectures in this discussion). Next, we will run the hypercube docker instance, which will itself take care of downloading and starting the rest of the Kubernetes components. The hypercube container is given special, extended privileges so that it can access resources of the host, as well as run other containers on the host. That is achieved by, first of all, mapping the /root, /sys and /var/run of the host to the container directories in the read-write mode. Secondly, the container is run with the --privileged option which grants access to all devices of the host to the container and allows starting new containers on the machine. This flag also requires the /var/lib/docker path to be a volume. --net=host and --pid=host are allowing access to the network and PID namespace of the host basically allowing docker that we are running to see and control processed on the host and reuse the network configurations. The started container runs the hyperkube binary which itself starts all the components we discussed so far. Now that we have a small Kubernetes setup on our host, we should get the command line tool to deploy our first pod and service. We will use the installer docker container to demonstrate the kubectl in action. As you can see, 2 containers have been created with our kubectl run command – the first one is the actual nginx container created and deployed by Kubernetes. The second one, as explained above, is an infrastructure container – this is the first container that is started for a pod, it sets up the network for the pod, then pauses. All other containers for a specific pod, join the network set up by this container. In order to access the deployed nginx container, we would need to declare it as a service and obtain a concrete IP address that got assigned to it. You can see the list of services, with assigned IP address and exposed ports. Let’s take the IP address only and set it to a variable to try accessing nginx. The output should contain the usual nginx welcome page. This guide gives you a high-level overview of the architecture and moving parts of a Kubernetes setup. We deployed a mini-kubernetes setup inside a docker container, and deployed our fist pod. In order to get a deeper understanding, you are highly encouraged to deploy each of the components separately and setup their communication from scratch.